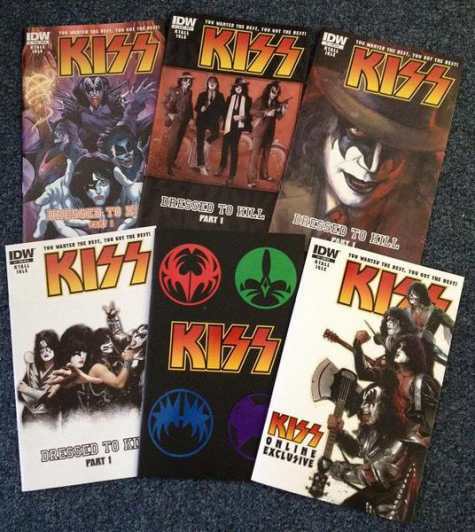 Back in April, IDW Publishing unveiled four covers of their new KISS comic book series (see here). The company is issuing “Dressed To Kill, part 1” as the first in a new series, set to be published on June 13. Now, IDW has provided an update on the KISS feature as they reveal an additional two covers for the project. In the above photo – from left to right - the top row features two regular covers available at most retailers and one limited cover available at select retailers; the bottom row shows a limited cover available at select retailers, while the black cover is exclusive to one retailer only, and the one on the right is the KissOnline.com exclusive. KISS will be written by Chris Ryall (Zombies vs Robots) with art by Jamal Igle (The Ray) and KISS #1-4 come with a special "solo album" covers by artist Michael Gaydos. The series is the second KISS have been involved with recently; “Archie Meets Kiss” was released last year. This summer, KISS hit the road July 20 for a tour with Motley Crue; shows are scheduled through to September 23.